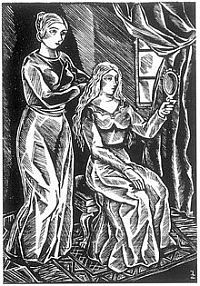 Zoe Glavani: A woman having her hair combed (1952, woodcut). To mark this year’s celebration of International Women’s Day on March 8, art collector Nikos Grigorakis has curated an exhibition dedicated to Greek women artists and engravers with 40 rare works which opens next Monday, March 17, at the Grigorakis Museum and Art Gallery. Grigorakis said he wanted to pay tribute to Greek women artists in two phases. The first is for artists born in the first two decades of the 20th century and who are no longer alive: Vasso Katraki, Fofo Kachrimani, Anna Kindyni, Sofia Laskaridou, Koula Bekiari, Ira Economidi and Celeste Polychroniadi. This group also includes the younger artists Zizi Makri and Zoe Glavani. The second group are mostly students of Costas Grammatopoulos, such as Aria Komianou, Julia Lakeridou, Jenny Markaki, Eleni Economidi, Liana Papaioannou, Rubina Sarelakou and the youngest of all, Maria Papadimitriou (Goritsa), born in 1967. The tribute concludes with a series of rare drawings by the Corfiot artist Maria Desylla. The exhibition ends on May 10. Grigorakis Museum and Art Gallery, 4 Iakinthon Street, Palaio Psychico, Athens, tel 210 6740806. Posted by grhomeboy in Archaeology Greece, Culture History Mythology, Hellenic Light Europe. Archaeologist Nikolaos E. Platon (1909-1992), a native of the island of Cephalonia, was an expert in Minoan civilization who undertook many excavations in Boeotia, Evia, Fthiotida, the Sporades and Crete. It was he who discovered the fourth Minoan palace and surrounding settlement, bringing to light a large number of exhibits, many of which are now in the Archaeological Museum of Iraklion in Crete. In a lecture at the Hellenic Center, London, his son Lefteris, professor of prehistoric archaeology at Athens University, said he hoped that some of these could be transferred to the Siteia Museum. Lefteris Platon’s lecture for the Greek Archaeological Committee of Britain was held on February 20. He described the work carried out by his father and the exploration that continues to this day, which he himself leads. Professor Platon presented a large number of slides showing Linear A inscriptions, gold and other objects, clay pots decorated with marine themes and stone objects. Posted by grhomeboy in Business & Economy, Food Greece. Vivartia, Greece’s largest food group, said yesterday it would tender for 100% of fast-food chain Everest as part of its 2008 expansion plans. Everest, with a current market value of 87 million euros, runs a network of 184 fast-food stores in Greece, Cyprus and Romania. Vivartia said it would offer 3.50 euro per share for the fast-food company, a premium of about 15 percent to Thursday’s closing price. Trading in Everest and Vivartia shares was suspended on Thursday and resumed yesterday. Alkmini, a company set up to bid for Everest, will also make a public offer to buy 100 percent of Olympic Catering, now majority-owned by Everest, for 2.65 euro per share. A pilot scheme to keep trains on the metro system and the Kifissia-Piraeus electric railway (ISAP) running until late has attracted stronger-than-expected interest from nighttime commuters, raising hopes the measure may be extended on a permanent basis. The scheme involves trains running until 2 o’clock on Saturday and Sunday mornings, rather than finishing at midnight, in a bid to offer Athenians an alternative to getting to and from their nighttime entertainment. Initial figures show that an additional 11,500 passengers have been using the metro line thanks to the longer hours, well above initial forecasts of an extra 3,000 to 4,000 passengers. ISAP passengers have also taken warmly to the measure, with 7,000 more passengers using the electric railway. The Transport Ministry and the City of Athens are in favor of the move as they see it as an obvious way to increase passenger numbers on lines 2 and 3 of the metro, which first opened to commuters seven years ago. AMEL, the firm that operates the Athens metro, estimates that the longer timetable will cost the company an additional 300,000 euros a month. Two-thirds of this cost will be for staff overtime. Athenians have been slow in switching to public transport, as many still opt for their own car despite the city’s massive traffic problems. Figures released recently show there were 35 million more passenger journeys on the city’s entire public transport network last year, compared to 2006, but this figure is considered to be a disappointingly low increase by many experts. Last year also saw increased use of the tram network. Some 16 million passengers used the two tram lines last year, compared to just 3.2 million in 2004, when the service was inaugurated. The Athens-Piraeus Electric Railway (ISAP) saw perhaps the most impressive rise, as 8.2 million more journeys were made compared to 2006. However, the bedrock of the public transport system, the ETHEL buses, recorded hardly any rise in commuter figures. Just over 360 million journeys were made by bus in Athens last year, which represents 51 percent of the city’s public transport network usage. Posted by grhomeboy in Greece News, Transport Air Sea Land. Ferries departing from Piraeus were almost fully booked and traffic on the country’s national highways picked up yesterday as holidaymakers abandoned the capital for the long weekend, authorities said. Planes leaving Athens International Airport (AIA) for domestic destinations were 84% booked while an extra 380 bus routes were scheduled yesterday and today to help meet the extra demand. Authorities increased traffic supervision of the country’s national highways as of yesterday afternoon by increasing patrols and using a police helicopter. Monday, Clean Monday or Kathara Deftera in Greek, is a public holiday in Greece, marking the end of the Carnival season.